Recommended for the rapid identification and differentiation of Listeria monocytogenes from other Listeria species based on rhamnose fermentation and PIPLC activity. HiCrome Selective Salmonella Agar Base is recommended for the selective isolation of Salmonella species from food samples. HiColiform Broth, Modified is used for the detection and confirmation of Escherichia coli and total coliforms from water samples, using a combination of chromogenic and fluorogenic substrates. HiCrome EC O157:H7 Selective Agar Base is recommended for selective isolation and easy detection of O157:H7 from food samples. HiCrome RajHans Medium (Salmonella Agar) is recommended for identification and differentiation of from among the members of Enterobacteriaceae , especially Proteus species. HiCrome MM Agar Modified is recommended for identification and differentiation of like Citrobacter from water samples. HiCrome VRE Agar Base, Modified is recommended for selective isolation and differentiation of Vancomycin Resistant Enterococcus faecalis and Enterococcus faecium from clinical specimens. HiCrome Acinetobacter Agar Base For selective isolation of Acinetobacter species from environmental and clinical samples. M-E.coli Broth is recommended for the detection, differentiation and enumeration of water samples using membrane filter technique without further confirmation. HiCrome Candida Differential Agar Base is selective and differential medium for rapid isolation and identification of Candida species from mixed cultures. HiCrome M-TEC Broth is recommended by the U.S. Environmental Protection Agency (USEPA) for detection of thermotolerant Escherichia coli in water by the membrane filtration technique. HiCrome MRSA Agar Base, Modified is recommended for the differentiation and identification of MRSA and MRSE Staphylococcus species. HiCrome ECC Agar is a differential medium recommended for presumptive identification of coliforms in food and environmental samples. HiCrome M-Coliform Differential is a selective and differential agar recommended for the detection of coliform bacteria using membrane filtration technique. Hicrome M-Modified EC0157:H7 Selective Agar Base is recommended for presumptive enumeration of EC0157:H7 by membrane filtration technique. HiCrome EC O157: H7 Agar is a chromogenic medium recommended for isolation and differentiation of O157:H7 from food and environmental samples. Coliform Broth w/ SLS is used as a medium for detection of E.coli and other Enterobacteriaceae in water samples. HiCrome Staph Selective Agar is a selective medium recommended for the isolation and enumeration of Staphylococcus aureus. HiCrome MM Agar is recommended for identification and differentiation of Citrobacter from water and clinical samples. HiCrome Coliform Agar w/ SLS is a selective agar recommended for the simultaneous detection of total coliforms in water and food samples. 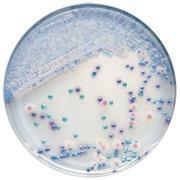 HiCrome Candida Differential Agar is recommended for rapid isolation and identification of cultures. 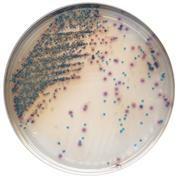 HiCrome VRE Agar Base is recommended for identification of Vancomycin Resistant Enterococci from clinical specimens. HiCrome Enterococcus faecium Agar Base is recommended for the chromogenic identification of from faeces, sewage and water supplies. HiCrome ECC Selective Agar is recommended for detection of Escherichia coli and coliforms in water and food samples. HiCrome ECC Selective Supplement (FD190) needed. HiCrome M-TEC Agar is recommended by the U.S. Environmental Protection Agency (USEPA) for detection of thermotolerant Escherichia coli in water by the membrane filtration technique.